A top Japanese ruling lawmaker said Sunday that Prime Minister Junichiro Koizumi was suspected of violating the Constitution by visiting a war shrine that is seen as a symbol of the country's militaristic past. Taku Yamasaki, a senior Liberal Democratic Party lawmaker who is a close Koizumi ally, told TV Asahi talk show that, "we have told [Koizumi] that the visits are strongly suspected as a Constitutional violation." Koizumi's five visits to Yasukuni Shrine - which honors Japan's war dead, including convicted war criminals - since taking office in 2001 have outraged China and Korea as well as critics in Japan, saying it shows a lack of remorse for the country's wartime atrocities in Asia. The shrine also hosts a museum defending Japan's past militarism. "However, there is room for further debate to determine whether it is unconstitutional," added Yamasaki, who heads a group of lawmakers proposing a separate, nonreligious state memorial to resolve Tokyo's diplomatic row with Asia. Japanese critics, including religious leaders and academics, as well as relatives of South Korean and Chinese war dead, have also filed nearly a dozen lawsuits against Koizumi, challenging the constitutionality of his Yasukuni visits. So far, most rulings have skirted that issue. Koizumi has defended his annual prayers at the shrine, saying the visits are made in a private capacity to pray for peace and denies that he defends militarism. He has also dismissed foreign calls to stop the visits as an interference in Japan's internal affairs. Most recently, he told reporters last week that it was a matter of "personal freedom" no matter how many times he goes there, fueling speculation that he might visit it again before the end of his term in September. Beijing has called the visits the key obstacle to improving relations with Japan. 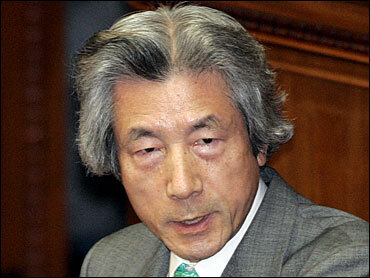 Koizumi last visited Yasukuni in October 2005, and China has since refused to hold a summit meeting with him until the issue is resolved. The Japanese courts have for the most part rejected their demands for compensation and skirted the constitutionality issue. In two exceptions, the Osaka High Court in October 2005 and the Fukuoka District Court in April 2004 ruled in separate suits that the visits violated the constitutional separation of the state and religion. Those suits are pending at higher courts. Also Sunday, opposition Democratic Party of Japan leader Ichiro Ozawa called for a removal of the 14 Class A war criminals convicted of crimes against humanity - including the executed seven - from the name list enshrined at Yasukuni so that Japanese leaders can visit it without facing criticisms. "It was a mistake to combine the war dead with the rest," Ozawa said. "Their names should be removed."